This album holds one of Graham's truely amazing arangements of Women of Ireland by Seam O'Riada. Very moving. Dedicated by Stan Watson to his two children, Naomi and Heironmous, and played on nylon-strung guitar, the E string tuned down to D. I like the way the pleasant acidity of the discords in the treble echoes the often-anomalous relationship between siblings. Better known from the Hamish Henderson se to it as 'The Freedom Come-All-Ye", the pipe tune dedicated to those who fell at the Battle of Loos in World War I. Hamish says it may be related to the tune "Busk, Busk Bonnie Lassie", as played by Alex Stuart of Perthshire. Davey uses the "high strung" tuning on his steel-string guitar. As the "title" indicates, Davey doesn't know much about this one. He plays it on the five course fretless Arabic oud, (tuned G-A-D-G-C), ancestor of the western lute, which even gets named (al-oud) from the original. The instrument has an extra-unused peg hole, because as Davey points out "only Allah is perfect"
Davey got the original score from Tim Walker. He has transported it down from the original C minor to B minor, and plays it on nylon strings. An Irish composed tune, which nevertheless popular with traditional musicians like the great travelled lady Margaret Barry. Davey plays it on the sarod. By Robert de Visee, a muscian at the court of Louis XIV, from a D minor suite composed in 1686. Davey plays it on the high-strung steel guitar. By Faramarz Payvar. Davey got this from a Nonesuch album of Persian classical music. It's a 6/8 dance from a longer piece called "Dastgah Mahour" and is played on the oud. 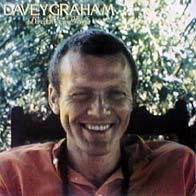 Though this comes from an English hymn - Davey learnt it in the Presbyterian church near his house when he was exploring the native esoteric teaching on Christianity - the way he has chorded it is very Horace Silver feel, to me, especially the unexpected F sharp minor seventh on the word "God". The high-strung steel rings out particularly well here. I like the tiny bass runs that start at the second line: simple and effective. From the repertoire of Joseph Spence, the Bahaman gospel singer and player who's "Bid You Goodnight" has been popularised by the Incredible String Band and the Grateful Dead. This tune has also been recorded by Ry Cooder. Again a very contemporary feel. By Pipe Major James Robertson. Another pipe tune made familiar, as it's song by Hamish Henderson, in this case as "The 51st Highland diversion's farewell to Sicily" High-strung steel guitar. This taqsim is an improvised piece, which occurs all over the Arab world. In Volume II of her superb six-album set, "Music in the World of Islam" Jean Jenkins records examples from Iraq, Bahrain and Turkey. Davey learnt this from two of his Israeli students and plays in on the oud. (Women of Ireland) by Seam O'Riada: Possibly one of my favourite pieces on the album, a slow air familiarised in the version by the Chieftains recorded for the Stanley Kubrick film "Barry Lyndon". Davey points out that the mode is a similar mode used by Miles Davis for "Kind of Blue" and also (I add) to Pentangle's "I've Got a Feeling". By Davey Graham: Dedicated to his now 19 year old daughter, this illustrates his playing on the bouzouki, which he plays (lord be praised) in a manner quiet different from the neo-madolin tinkling associated with certain groups on the folk scene. He prefers this recording to his guitar version on his earlier "All That Moody" album. By John Dowland (1562-1626): I've been unable to find any definition of a puffle, so I suppose we'll have to assume it means what it sounds like: A trifle, or a diversion. Dowland was one of the greatest lute players of his time, playing at the courts of King Charles I in London. A Moroccan tune played on the oud, related to the melhoun devotional songs of the south of the country. By Orlando Gibbons (1583-1625): The first is a communion hymn , the second called "Eternal Rules of the Ceaseless Round" Nylon-strung guitar. A Turkish folk song about the finding of a lover's handkerchief. Here preformed on the sarod.